Since opening in the new Westgate centre at the end of last year, The Alchemist has quickly become a go-to destination for discerning cocktail drinkers. Popping in early one chilly Tuesday evening, I was surprised at how busy it was and even more surprised to discover a dining area at the back of the venue and decided I had to return to try out their menu. Over the festive break, I heard some very good things about the food and equally, some not so good comments. As it happened, I got to try it out on two separate occasions, once incognito with a New Year money off deal and once when Bitten was invited in for a complimentary review meal. 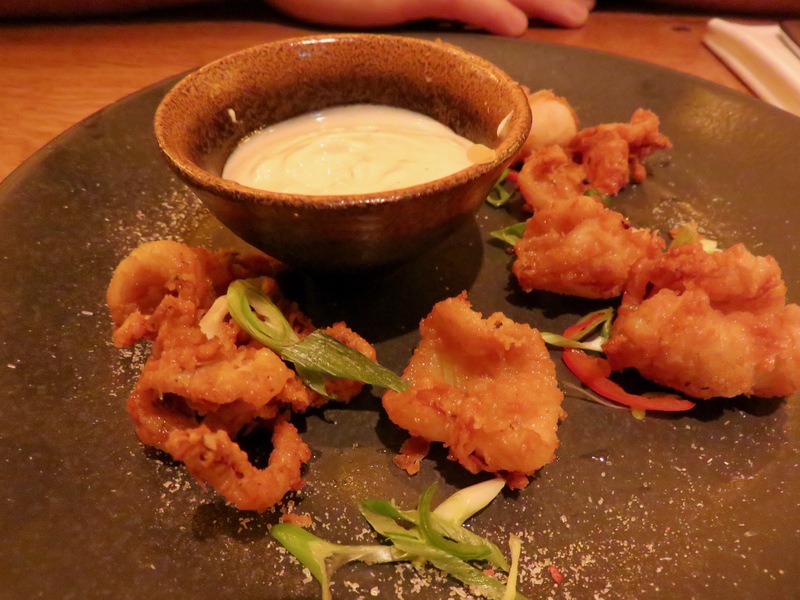 Hence, this review is a combination of both visits – we didn’t eat all this in one go! Our first visit was booked online where plenty of time slots were available so I was surprised to receive a confirmation of my 6pm booking telling me that my table would be required back at 7.30pm! Luckily, my husband and I don’t bother with social niceties such as conversation and instead, prefer to eat and get the hell out of Dodge. But even for us, ninety minutes for a full meal was going to be pushing it. Had that been with the work wife, impossible! We arrived early on purpose to give us a few minutes for menu perusing but was greeted with a bit of a sigh and a “I’ll check if your table is ready”. After 5 minutes we were shown to our table in a half empty restaurant so that was a little odd. Bottled tap water was on the table already and we were asked if we’d prefer a colder bottle. Our server confirmed that this water is filtered rather than the nasty, hard Oxford water which was a bonus point. Reading the menu was a little challenging, dim lighting which got dimmer as the evening progressed and flickering candlelight meant I could just about cope with the food menu but was completely lost on the cocktail menu so stuck to a soft drink. 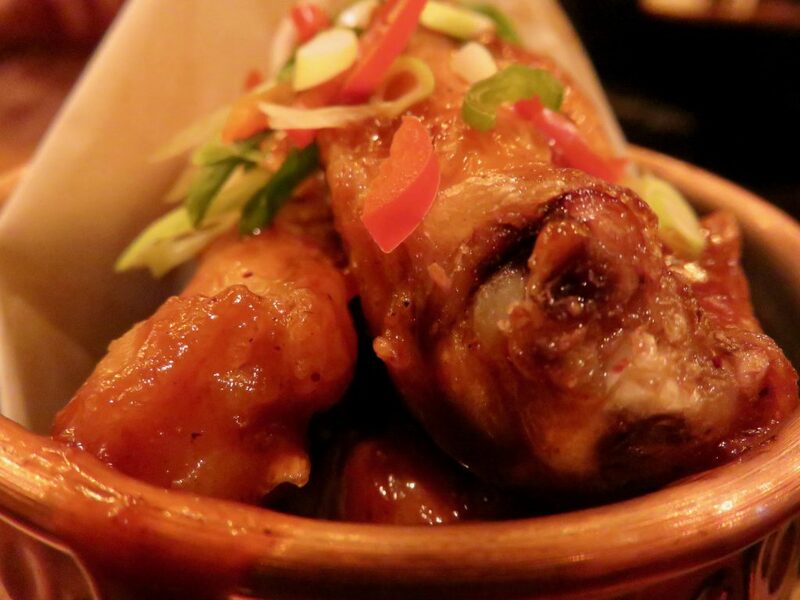 Starters – well there was chicken wings which had to be ordered. 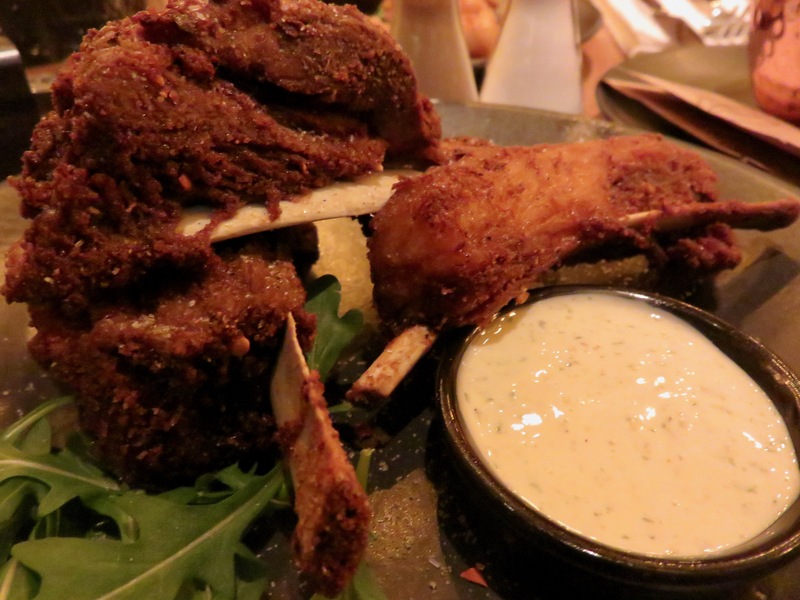 These come as a choice of bbq, sriracha or salt and pepper £6.25, salt and pepper squid with lemon mayo £6.50 and crispy lamb ribs with mint sour cream for £6.75. 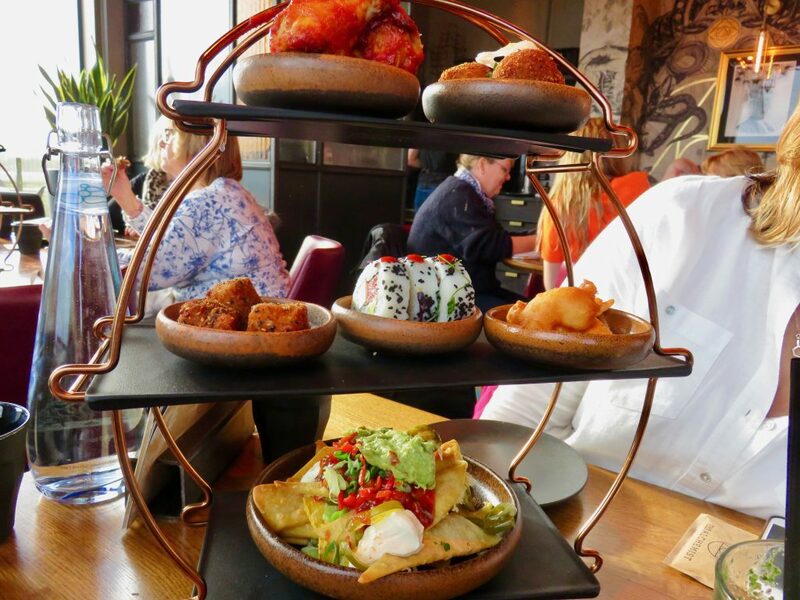 On our second visit we opted for the Social #1, £20 which comprises of wings, nachos, pork bon bons, mac n cheese bites, battered prawns and California rolls. On both occasions, I found the chicken wings odd. The method of cooking wasn’t clear and they had a slightly rubbery, chunky texture, rather than the usual moist, strip chicken feel. Possibly the only time I’ve refused a chicken wing. Second visit we asked for clarification and was told they’re baked then flash fried. However, there wasn’t a greasy mouth feel, they weren’t dry or moist, no crispiness and really quite peculiar. On the plus side, they did come with individual wet wipes, something sadly lacking in most places. The squid was a good mix of both tentacles and bodie, pale and crispy with a zingy citrus sauce and the lamb ribs were cracking. Hot, crispy, sweet and well flavoured with the rendered down lamb fat keeping the meat deliciously moist. These need to be eaten right away, warm or even cool lamb fat is not pleasant, but piping hot they’re absolutely spot on. The so-called social platter is interesting. Plonked right in the centre of our table, it’s a three tier afternoon tea stand loaded with tapas style plates but…. each dish comes with an odd number! There’s an odd number of prawns, bon bons, mac n cheese bites, California rolls, and that’s not conducive to a social sharing platter! You can’t see through to engage with your dining companion other than clashing forks as you try to spear the last bite. The mac n cheese bites were okay, crunchy with a good cheese string and a punchy chipotle mayo, pork bon bons had a lovely smoky, sweet and spicy pulled pork filling, prawns were your normal, battered prawns – nice enough but nothing special. The California rolls had a quite vinegary sticky rice wrapped around feta, avocado and watermelon which didn’t really work for us. The nachos, usually a bit of a cheap filler on a sharing platter were winners here. 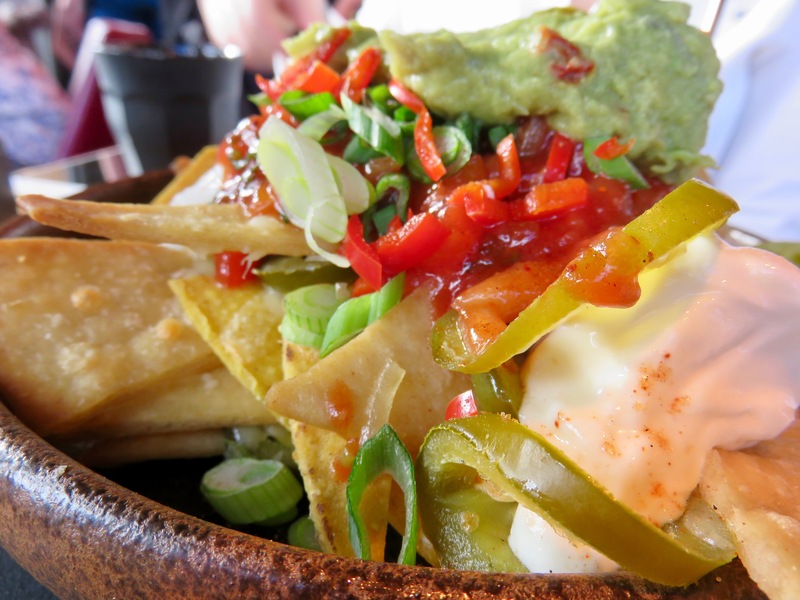 Big, puffy, crunchy nachos with generous helpings of salsa, guacamole, sliced chillis, sour cream and melted cheese. Really, really good and as far removed from a bag of Doritos and jar of salsa as you can get. 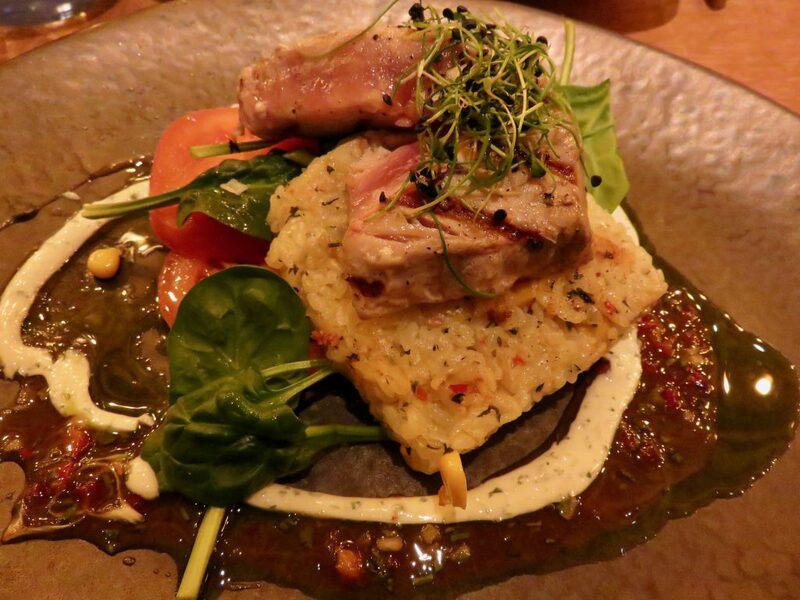 Main dishes on the Alchemist menu are a little different to what you’d expect and so we opted for something more unusual. 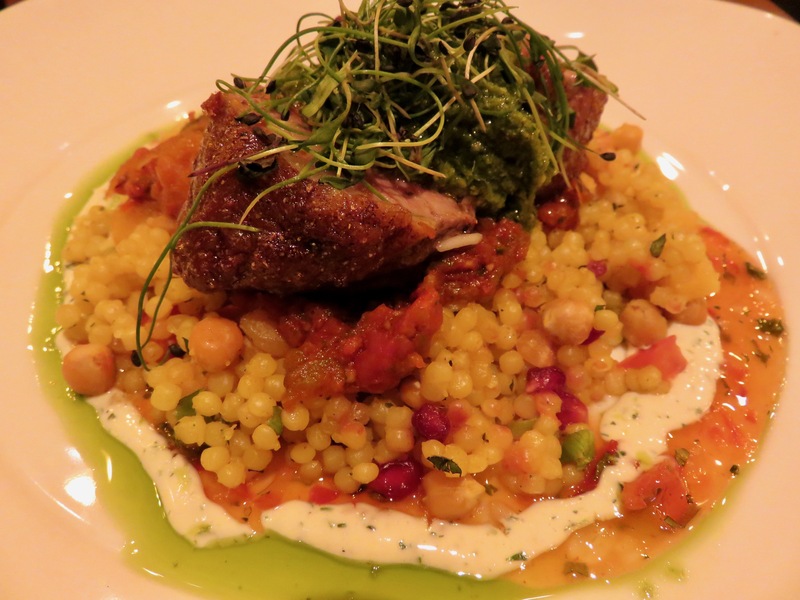 Moroccan lamb rump with couscous and shakshuka, £16 was a big success. Well caramelised and crispy on the outside with a pink interior, and well balanced flavours. The shakshuka was warming rather than spicy hot and worked well with the rest of the dish, all of which had traditional Moroccan flavours blended so that there wasn’t a dominant flavour but a blend of cumin, coriander, cinnamon, pepper and a smidge of allspice. My seared tuna loin, £16, arrived on a Mexican rice fritter with a chilli tomato salsa. The fish was perfectly cooked, pink as I requested, but I found the rice fritter a little odd. The addition of red pepper and sweetcorn certainly gave it the appearance of Mexican rice but for me it lacked any hint of flavour. The salsa too was more reminiscent of a sweet chilli sauce than a salsa – again it worked on the plate but wasn’t quite what I was expecting. Having said that, I thoroughly enjoyed it. 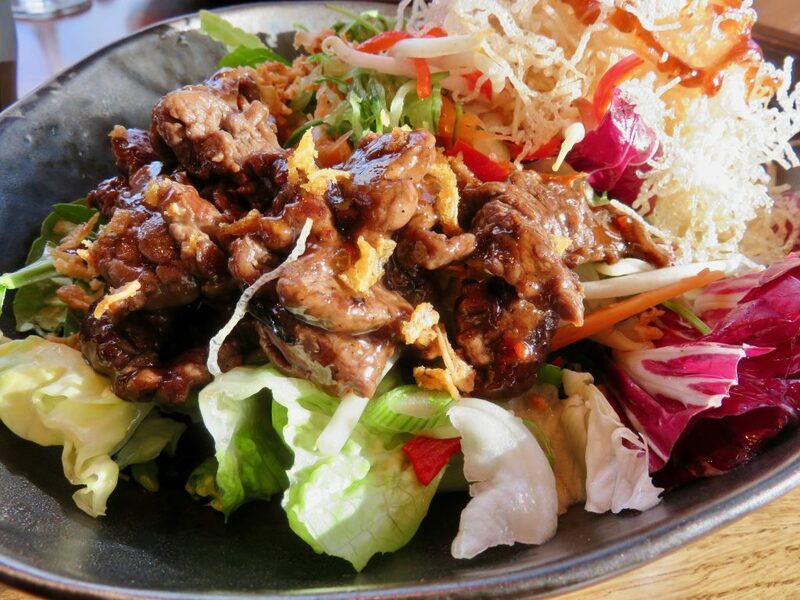 A huge bowl of salad with a topping of sticky beef for £12 was difficult to eat and messy. Plenty of leaves, carrot, peppers but engulfed in fried noodles which scattered across the table. 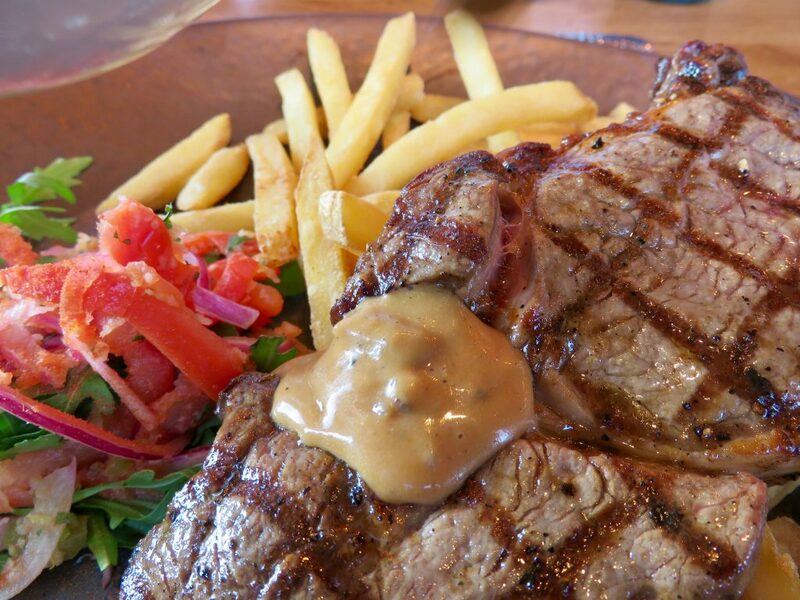 A 9oz ribeye with peppercorn sauce and fries, £17.50 was a more successful choice. Perfectly cooked and seasoned, the ribeye fat melting through really well despite my request for the meat to be rare showed good caramelisation and well timed cooking. 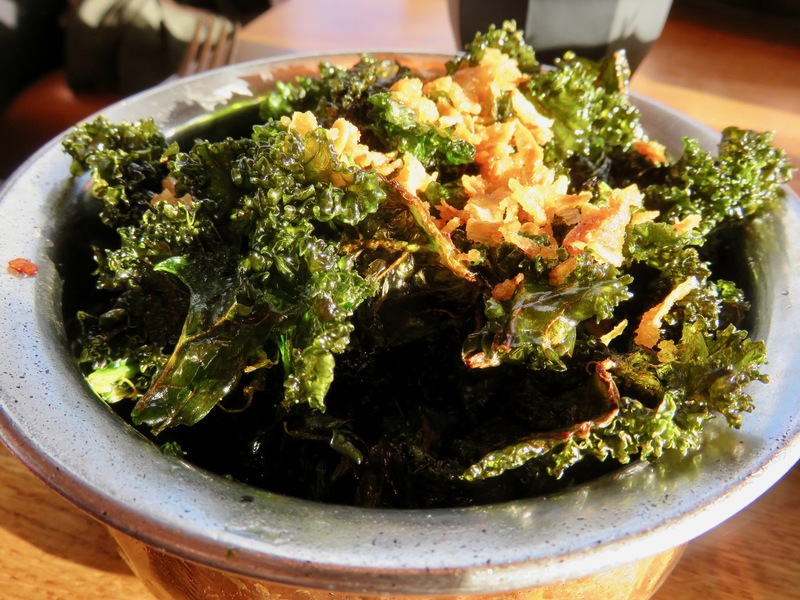 We also had a side of crispy kale, £2.50 but both of us found this just too greasy for us so avoided it. On both occasions we managed to save some room for dessert. 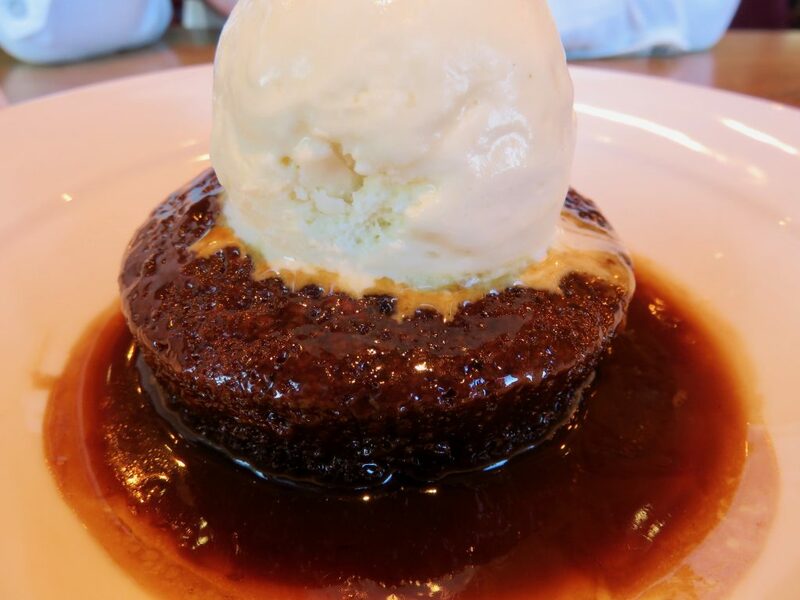 The £5.75 sticky toffee pudding was a big success, the very light sponge had dates blitzed into the batter so no chewy lumpy bits and the accompanying toffee sauce was droolworthy. With a scoop of good vanilla ice-cream, this was a much lighter dessert than anticipated. Cinnamon waffles nearly finished me though and if it hadn’t been for the restorative powers of an espresso martini, I would have rolled home. 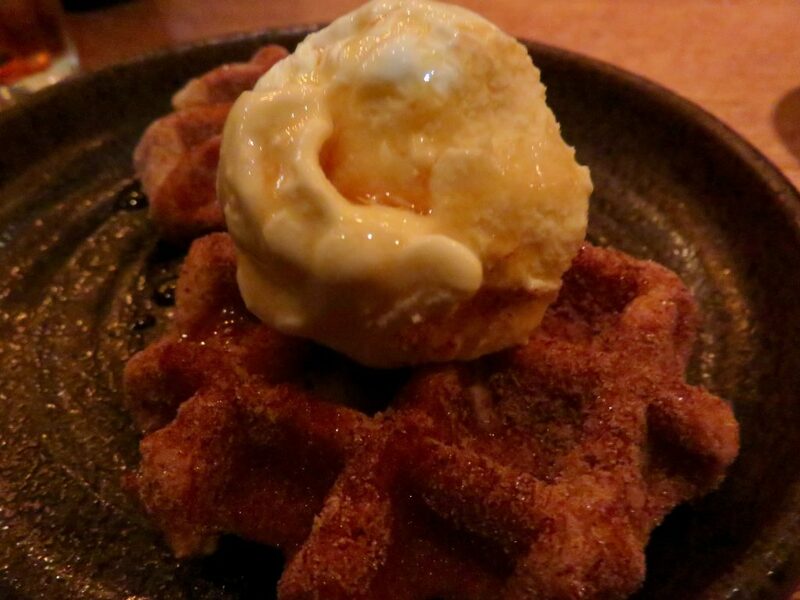 This £5 dish gave me two big, fluffy, liberally cinnamon sugared warm waffles with vanilla ice cream. Both occasions had more hits than misses and I’d happily go back and eat there again. The service can be a little slow so the timing pressure was nearly a thing but we managed to leave with mere minutes to spare.